GATT. On April 15, MARY, passed away peacefully, aged 79, comforted by the rites of Holy Church. She leaves to mourn her loss her son Mario and his wife Dorothy, her grandchildren Luke and Diane, her brother Frank and his wife Bridie, many in-laws and their families, other relatives and friends. 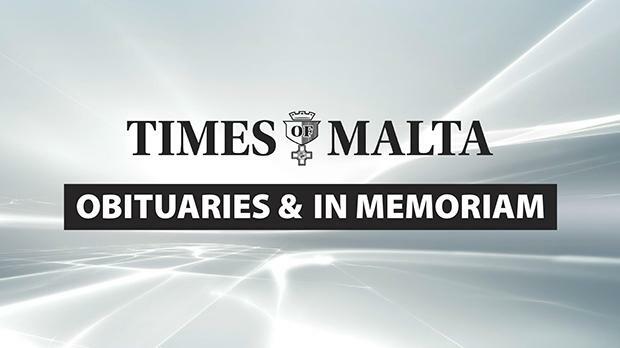 The funeral leaves Mater Dei Hospital tomorrow, Wednesday, April 17, at 1.30pm for San Ġwann parish church where Mass will be celebrated at 2pm followed by interment in the family grave at Santa Maria Addolorata Cemetery. No flowers by request but donations to Hospice Malta, Attard, will be greatly appreciated. Lord, grant her eternal rest. GIALANZE. On April 13, GILLIAN widow of Dr Michael Gialanze, passed away peacefully at the age of 65, comforted by the rites of Holy Church. She leaves to mourn her loss her beloved children Nicola, Christian and Gayle, her grandchildren Luke, Sam, Michael, Elly, her in-laws Miriam Farrugia, Godfrey Gialanze, Maria Gialanze, nephews and nieces, other relatives and friends. The funeral cortege leaves Mater Dei Hospital tomorrow, Wednesday, April 17, at 9.30am, for Jesus of Nazareth parish church, Sliema, where funeral Mass præsente cadavere will be said at 10am followed by interment in the family grave at Ħniena Divina cemetery, St Paul’s Bay. No flowers by request but donations to id-Dar tal-Providenza, Siġġiewi will be greatly appreciated. Lord, grant her eternal rest. McNAMARA – MICHAEL REX. Born in Johannesburg in 1936, sadly passed away on April 12 at Mater Dei Hospital. He leaves to mourn his great loss his wife Diana née deCesare, his beloved children Deborah, wife of Nicholas Caruana Turner, Nickie and Alister and Sharron, his grandchildren Cosmo, Michael, Jamie, Mischka and Mia, his in-laws Stephanie and Alfred Calascione, Ian deCesare and his partner Sue, Kevin deCesare and Graziella deCesare, his nieces, nephews, Sally and Solange and his many friends. The funeral Mass will be held today, Tuesday, April 16, at Our Lady of Mount Carmel parish church, Balluta, at 8.30am. Lord, grant him eternal rest. The family would like to thank Dr Karen Cassar and all the staff at Mater Dei Hospital for their care and dedication. MORRIS – ANTHONY. Born in Manchester, UK, on February 21, 1938. Sadly passed away on April 14 at Mater Dei Hospital. He leaves to mourn his great loss his wife Joan née Borg and family, his brothers and sisters, Andrew and Eilene Morris, Irene and Richard Brader, Wendy Kelly, Margaut and Don Morris. The funeral Mass will be held tomorrow, Wednesday, April 17, at St George parish church, Qormi, at 2pm. Lord, grant him eternal rest. The family would like to thank all staff at Mater Dei Hospital for their care and dedication. CINI – ERIC. Treasured and unfading memories of our father, today the 39th anniversary of his demise. Always in our thoughts and prayers. His children, their spouses and their families. Lord, grant him eternal rest. MANCHÉ – YVONNE. Treasured memories of a beloved mother, grandmother and great-grandmother on the eighth anniversary of her passing to eternal life. Always in our thoughts and prayers. Marie Antoinette, Henri, grandchildren and great-grandchildren. Lord, grant her eternal rest. MUSCAT – PIERRE. Loving memories of a dear husband and father, today being the 29th anniversary of his demise. Forever in our hearts and prayers. His wife Felicity and sons John, Karl and Luke. Lord, grant him eternal rest. STORACE – JOSEPH E. (1906 - 1995). In lovingly memory. His children and grandchildren. TONNA – ĠUŻEPPI. In loving memory of a dear father, grandfather and great-grandfather on the 25th anniversary of his death. His daughter Carmen and son Freddie and their families. Lord, grant him eternal rest.